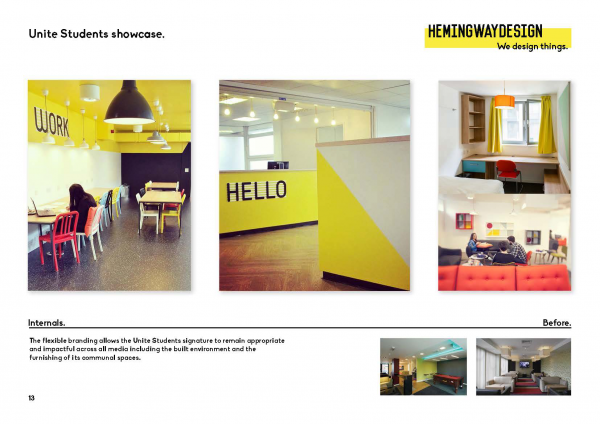 HemingwayDesign analysed and reviewed the existing Unite brand identity and how it was manifested across printed media, digital communications, signage and in the fittings and furnishing of their properties. 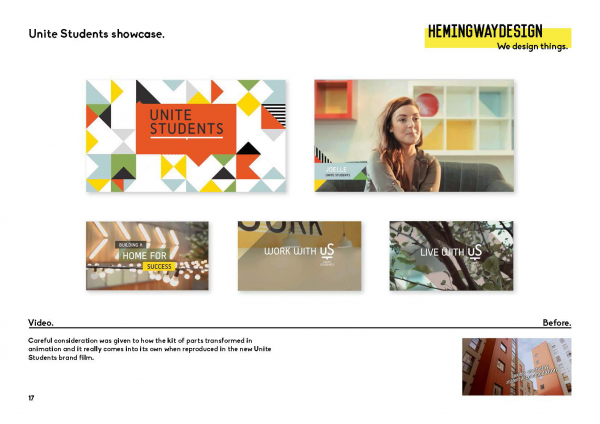 The analysis culminated in a proposal for a youthful and flexible brand signature that showcased a fulfilling student lifestyle for Unite residents. The completed work has resulted in a change of name to Unite Students, and a new flexible, customer facing identity that provides a more immersive, playful and rewarding experience for the client and their customer. 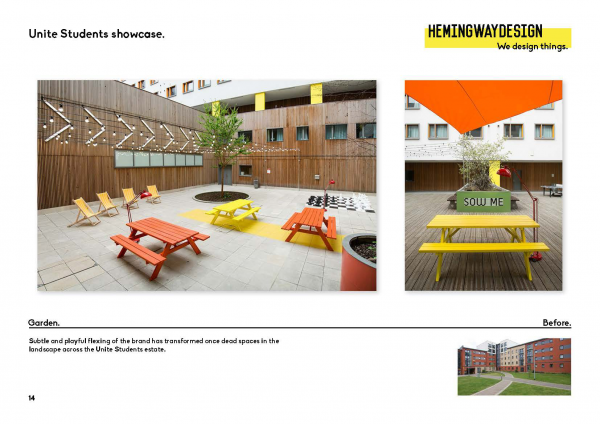 HemingwayDesign also completed a review of the furniture packages in common spaces across the Unite Students estate and produced new packages to subtly reinforce the brand signature. After extremely positive feedback from client and their stakeholders we are continuing to work with Unite Students on the roll out across their business and estate including new buildings in construction and those still in planning phase. Led by Jack and Tilly Hemingway supported by Kate Costigan and overseen by elder states-folk Wayne and Gerardine Hemingway with invaluable input from the Unite Students management and marketing teams. 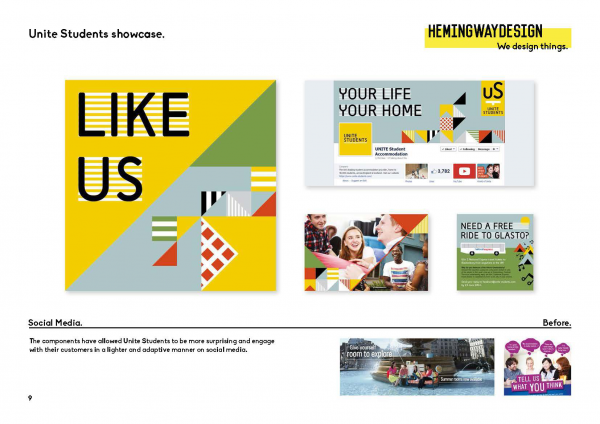 Provide the design and branding expertise for a transformational repurposing of the Unite business and create a fresh brand identity that positions Unite as the most desirable student accommodation in the UK, defined by the brand promise ‘Home for Success’. 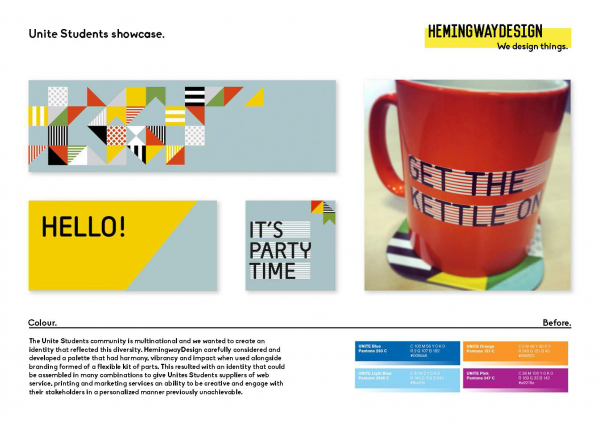 HemingwayDesign produced a flexible identity in the form of a kit of parts including logo devices, colour and pattern that reinforced a brand continuity and recognition whilst allowing fluidity. The kit allows Unite Students to express itself, adapt and remain relevant to its audience and situation. The Unite Students community is multinational and we wanted to create an identity that reflected this diversity. 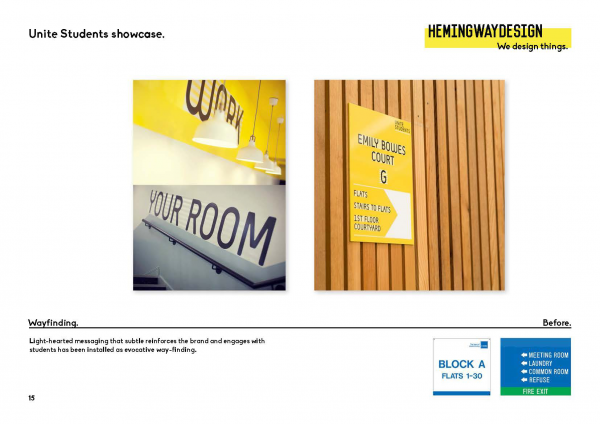 HemingwayDesign carefully considered and developed a palette that had harmony, vibrancy and impact when used alongside branding formed of a flexible kit of parts. 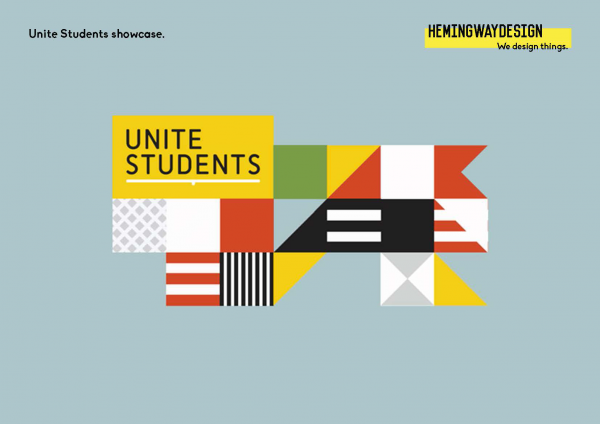 This resulted with an identity that could be assembled in many combinations to give Unites Students suppliers of web service, printing and marketing services an ability to be creative and engage with their stakeholders in a personalized manner previously unachievable. The components have allowed Unite Students to be more surprising and engage with their customers in a lighter and adaptive manner on social media. 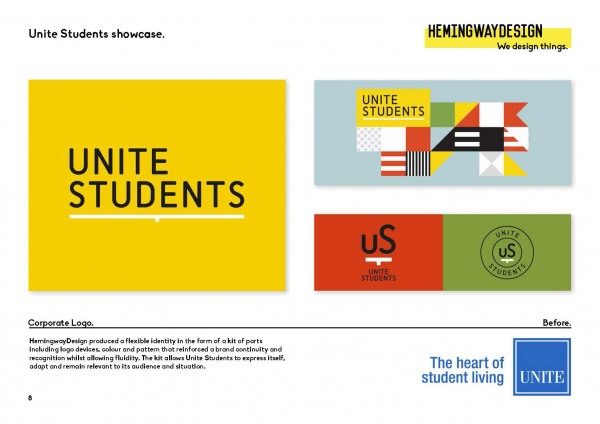 The flexibility allows for extra creativity and tailored engagement in Unite Students marketing material whilst preserving a brand signature and familiarity. The Unite branding collateral felt dated, dour, stiff and in need of an injection of youth and colour with a focus on lifestyle and the fun of being a student. Our aim was to move the brand away from its rigid, corporate and repetitive personality and consider how it reached beyond its appearance in print to interact with its audience in the built environment and across a multitude of technology platforms. 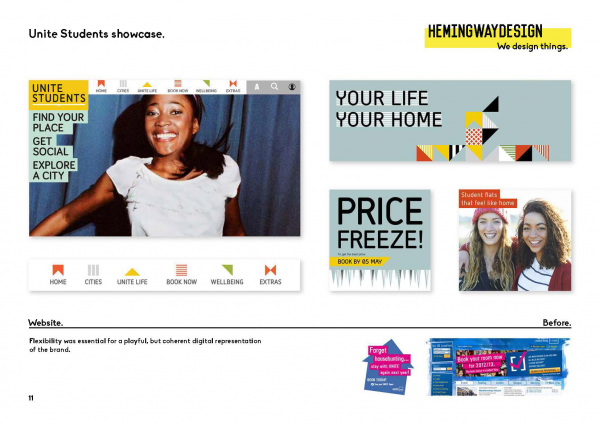 The Hemingway team undertook exhaustive research of our, and other, youth sectors, and began by critiquing the existing manifestations of our brand, and understanding the scale of our appetite for change. Mapping out what it would mean for students, staff and universities in terms of our physical space and visual identity. In rapid order we had agreed a new branding approach, and one that we could never have envisaged at the outset – a flexible family of colours, graphics and logos to be used in a balanced way across all our channels and properties. We completely love it, as do our students and university partners, and it provides our creative agencies and in-house teams with limitless opportunities to express themselves and have fun with our brand. 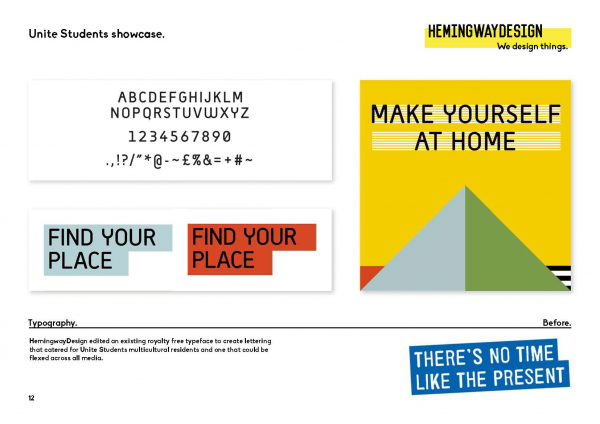 Throughout this process one additional thing has been clear to me – HemingwayDesign genuinely want to make a positive difference through design, and in a way which adds value to society. It is not often you work with an agency that prioritises social impact over everything else.